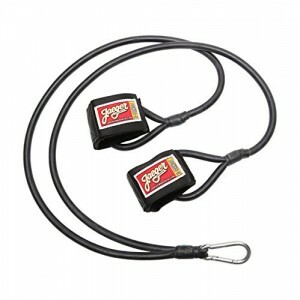 J-Bands from Jaeger Sports are a must-have item for all youth baseball and softball players. All of the coaches my kids have had over the last few years recommend them, and they are crucial for any player who is pitching. Many kids start to have problems with their elbows and shoulders because they are weak and underdeveloped, and J-Bands help to strengthen them and also increase stamina. J-Bands are surgical tubing straps with wrist cuffs for band resistance training, that create resistance at a level that anyone can use. It is recommended that players warm up with these before every practice and game to increase arm, shoulder, and elbow strength. This is something that players can easily carry in their ball bags and they will actually use them. All they need is a fence or a place to hook them to and they are ready to go. They are highly recommended by pitching coaches and they get great reviews on Amazon. The reason these work so well is that they allow shoulder and arm rotation with resistance, resulting in strengthening of shoulders, arms, and elbows. And, as opposed to using weights which could be too heavy, anyone using them can go at their own stretching pace. If you start your kids early with these, they will develop the habit of using them every time they practice or play. I have included a video below from Alan Jaeger, the creator of J-Bands, which shows some of the exercises he recommends doing with them. Funny how this morning I was just thinking how my 50 something year old arms are starting to get flabby and how I need to figure out a way to build this babies up again before Spring weather and short sleeves are bad in my wardrobe! Low and behold I came across your fantastic web-site and this product j bands. Maybe I can do enough reps and enough sets to make an improvement on these bad girls. Thanks for the info and definitely I’ll try it out. Yes I played softball and was on a over thirties league for a few years. Awesome Carrie! I played softball as well, and these J-Bands would work for anyone who wants to firm up their arms. As we age we get weaker, and a lot more aches and pains and working out with these is a low-impact way to get in shape. Thanks for visiting my page. This looks like a great product, thank you for showcasing it! I looked around the rest of your site as well and you have a lot of great ideas for all types of occasions. Putting the link from the creator in was a great idea as well, who better to give an instructional then the person who made it. Justin, thanks so much for your kind words about my website. I’m really enjoying putting information out about baseball. It’s one of my favorite things in life.